A backhoe loader from New Holland is delivering superior performance in one of the harshest environments in Australia without losing a day’s work. 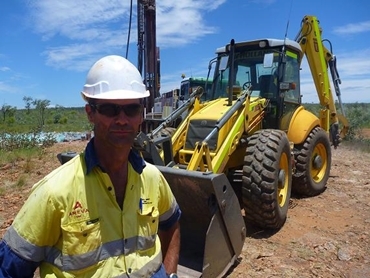 David Tiller, the owner of the backhoe loader has hired the machine to an exploration company where he works as a project logistic supervisor in the remote Tanami Desert, 250 kilometres south east of Halls Creek in Western Australia, almost 3,000 kilometres north east of Perth. The B115B backhoe loader was purchased from New Holland Construction dealership Geo Machinery in Burton, South Australia. David wanted the reliability of a new machine and after exploring various brands, zeroed in on the New Holland backhoe loaders based on their reputation as well as a conviction that it would not break down in the middle of nowhere. The Tanami Desert is one of the most isolated and arid places on earth and although conditions are very tough, punctured tyres are the worst he has had to contend with over the past few months. David says that the B115 backhoe is built to perform in extreme conditions with temperatures ranging from the high 30s to the mid 40s. He adds that the air conditioner works well, delivering comfort in spite of a glass cab. The backhoe is used for clearing vegetation, repairing creek crossings, moving rocks and smoothing rough terrain to give exploration crews access to uninhabitable regions. David elaborates that scrub can be three to four metres high and quite dense in areas. Additionally, there is thick grass, bugs as well as trees and the conditions can get wet and boggy. With plenty of rain this season, the backhoe has done a couple of almost metre-high water crossings. Since the area burns regularly in the dry seasons, it leaves stumps in the ground that can cause real issues with site access. Some of the other applications where the backhoe loader has been put to good use include track clearing and maintenance work involving trimming branches hanging over paths. The backhoe was used to clear an old airstrip that had been abandoned for many years. The B115B backhoe is also used to do the prep work before drilling since drill rigs and drillers need a flat surface to work on. The backhoe has been employed for rehabilitation work after the completion of exploration work. The ground is quite smooth on the drill pads after drilling and the backhoe is used to scarify the top of the earth using the teeth on the bucket. The B115B has a multi-task bucket that was specifically designed for David. The four-in-one bucket acts like a big pair of hands with teeth welded on the bucket and custom made two-tonne rated forks. The forks allow the backhoe to handle lifting jobs at the camp such as drill core samples and camp equipment.